With the NLP Sample application, you can analyze text on social media websites such as Facebook, Twitter, and YouTube to obtain business intelligence that can improve the services that you offer to your customers. To analyze that text, you must configure a data set rule, a text analyzer rule, and a data flow rule. Create and configure a data set of type Facebook, Twitter or YouTube. Create and configure an instance of the text analyzer rule that performs text analysis of the records from the source data set. You can use the sample rule named FTModels that is provided by the NLP Sample application. Create a data flow that references the text analyzer and processes the text-based content from the data set. 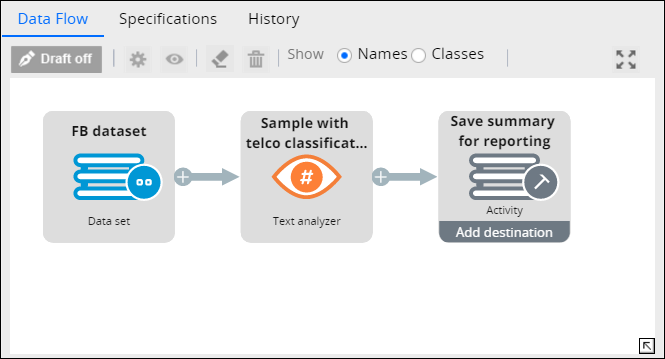 You have created and configured the rules that support text analytics in the Pega 7 Platform and started a data flow that includes a text analyzer to extract and analyze text-based content from social media. You can now access the NLP Sample portal to view all analyzed records one by one or generate text analytics reports that provide a visual overview of analyzed data.